Feb. 27, 1947: Terry Tate, of 123 N. San Pedro Street, is arrested in the death of his wife, Mary, at 107 Weller Street, described by the Sentinel as a rooming house or hotel. Tate was strangled and beaten Jan. 18, 1947. In July, Ocar J. Hallgren was arrested in the killing, which was never solved. 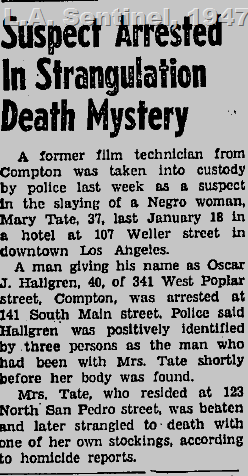 This entry was posted in 1947, African Americans, Black Dahlia, Cold Cases, Crime and Courts, LAPD and tagged 1947, black dahlia, cold cases, crime and courts, lapd, Mary Tate, Oscar Hallgren, Terry Tate. Bookmark the permalink. 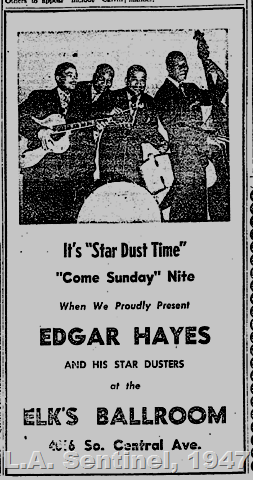 Hallgren lived in Compton, which in the late 1940s was a mostly white middle class neighborhood. Residents included George and Barbara Bush! Thank you for the Mary Tate update. I was very curious to know more. No “flower murder” nickname for Mary. It’s is very interesting to note that the murder site is a rooming house in February and a hotel in July. A substantial number of the small downtown “hotels” evolved into flop houses. It was a fun story to learn that Weller Street used to be called Wilmington because of the Stage Coach “races” from San Pedro as you know.